capture my opinion perfectly, yet, here we are. Via ~SeiAni on Deviant Art. I used this introductory section during much of the season to wax poetic about the state of the team, what they needed to do, and where they needed to go from a particular point in time. Now doesn't really feel like the time for any of that nonsense, does it? Things are simple to describe now. Two matches remain. 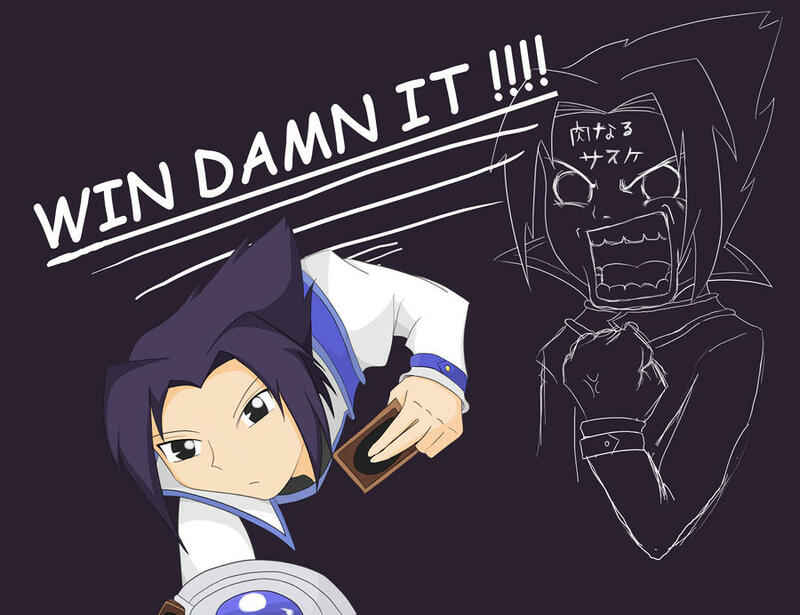 Win both and clinch third place. Drop points and European qualification falls out of your hands. Also, I can't deal with the thought of dropping points to a team whose logo also has a bird sitting on a ball. signed. Never mind, carry on... Photo: Daily Mail. It's been said that Theo Walcott could possibly feature in the final game of the season against West Brom, though he will almost certainly be unavailable for this one. More news on him should probably be expected from Wenger's presser on Friday. It's more bad news for Abou Diaby, who came up limping at Stoke last week. It's a calf strain and it will keep him out of the final two matches of the season. So, Diaby's final stats from this year: five matches played, all off the bench, over which he played no more than 110 total minutes. Here's a great piece on another blog about the intricacies of his history of injuries, as written by a physiotherapist. Enlightening stuff. There's no other news about injuries, so I wouldn't think the squad would be too different from last week, minus Diaby on the bench. Adam Drury pulled up with a thigh injury after only ten minutes of last weekend's Norwich match against Liverpool and could miss this week too. Center back Zak Whitbread could still be short with a groin injury. Norwich have two long term injured players. Daniel Ayala has knee ligament damage while Marc Tierney has had a small operation on his groin. This photo is legitimately terrifying. Photo: Guardian. Well, Arsenal sure were flying high until the middle of April, weren't they? 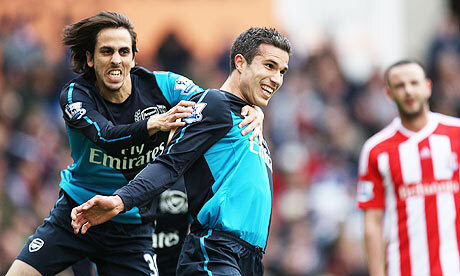 Going into that match against Wigan, Arsenal had won eight of nine. Starting with that match: three games, two draws, two points, two goals scored. They've dropped points in consecutive matches at home. They have drawn two straight for the first time in a little over a year (that goes back to consecutive capitulations against Liverpool and Tottenham.) The good news is, none of that really matters right now, because all that matters is winning the next two. As for Norwich, they are in a slump. Comfortably mid-table, the Canaries have now lost three straight in the league since they beat Tottenham at the Lane (thanks for that again, by the way.) They have dropped from 10th to 14th. The losing run started when Manchester City hit them for six at Carrow Road. A week later, Norwich was surprised in a 2-0 loss to Blackburn Rovers at Ewood Park. 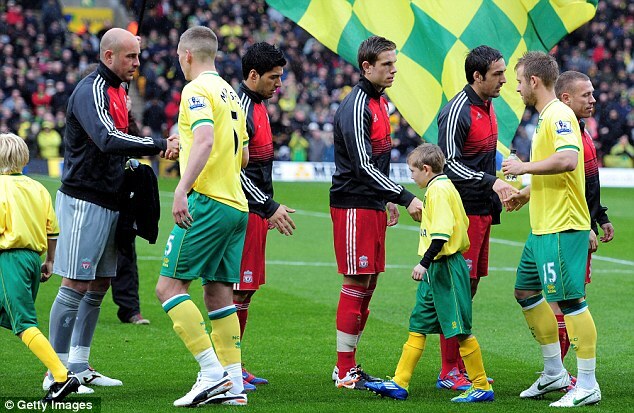 Last week, Luis Suarez had a hat trick as Liverpool won 3-0 at Carrow Road. Norwich's only goal during the streak cut their deficit against City to 2-1 before City banged in four more. to score 20 more goals over the last two games of the year. Arsenal won the reverse fixture 2-1 at Carrow Road in November; that win marked the last of a five match winning streak in the league for Arsenal before they were held by Fulham at the Emirates a week later. Norwich scored first, in the 16th minute, via Steve Morison. Robin van Persie leveled the score in the 27th minute and won it in the 59th. Grant Holt attempted to draw a penalty late, but was shown a yellow card by Phil Dowd for simulation and for eating all the pies. And let's be clear, Phil Dowd wanted those pies. Norwich's last year in the top flight before this season was in 2004/05, when Arsenal beat them in both matches by 4-1 scorelines. At Highbury, Thierry Henry had a hat trick, with Freddie Ljungberg supplying the other Arsenal goal. Norwich last picked up a point against Arsenal in North London via a 0-0 draw in October of 1993. The Canaries last win visiting Arsenal was August 15, 1992, by a 4-2 score. Arsenal led 2-0 before Norwich scored four in the final 21 minutes. for you..." Photo: Football Fair Play. The referee is Manchester-based Anthony Taylor, working his third career Arsenal match. It's also only his second Arsenal league match, the first of which was a 0-0 draw against Sunderland at the Emirates last year. In that match, he denied Arsenal a late penalty and one of the linesmen incorrectly flagged Andrei Arshavin offside, negating a potential game winner. The one Arsenal match he worked this year was much less controversial; it was the 2-1 Carling Cup win over Bolton at the Emirates in October. Taylor has taken charge of two Norwich matches this season: a 3-3 draw with Blackburn Rovers at Carrow Road and a 2-1 loss to Fulham at Craven Cottage. Taylor is the Select Group's second youngest referee. Only Michael Oliver is younger and working games at this level. In 33 matches this year, Taylor has shown 101 yellow cards and 8 red cards. Three of those reds came in his first game of the season, in the Championship, between Leeds United and Middlesbrough. 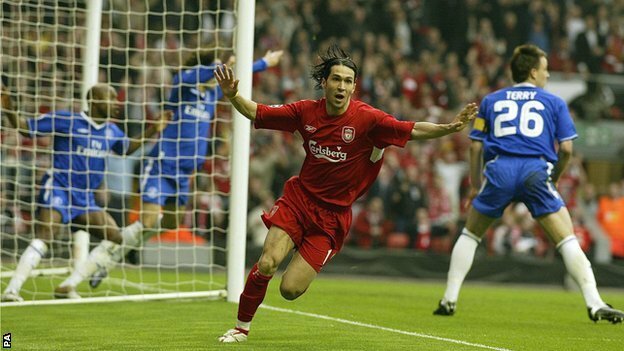 League Final on Luis Garcia's ghost goal. Saturday's FA Cup Final at Wembley Stadium between Liverpool and Chelsea means that Arsenal v. Norwich is the only league game scheduled for May 5. Seven of the ten league matches for this round of fixtures will be played on Sunday, one more will be played on Monday, and the last one will be played on Tuesday. Incidentally, that final game is Liverpool v. Chelsea at Anfield, because these two teams would have been playing each other this weekend anyway. Manchester City has the title race in their control again, on goal difference as they are level with United. City have a tricky trip to Newcastle, though, which opens up play on Sunday. Manchester United will be playing Sunday's late game, as they host Swansea at Old Trafford. There are five games in the middle, then, to be played at 9:00 a.m. Eastern time on Sunday. They are: Aston Villa v. Tottenham at Villa Park, Bolton v. West Brom at the Reebok, Fulham v. Sunderland and QPR v. Stoke, both in West London, and Wolves v. Everton at Molineux. Monday night (3:00 p.m. Eastern) is a huge relegation six-pointer, as Blackburn Rovers hosts Wigan Athletic at Ewood Park. Wigan are three points clear of the drop zone. QPR are clear over Bolton on goal difference. Blackburn are three points from safety.